Okay, food confession time. When I was a kid, I LOVED McCain’s Deep ‘n Delicious chocolate cake. My mom never baked chocolate cake, so Deep ‘n Delicious is the chocolate cake that has all my warm and fuzzy nostalgic childhood memories. I’m pretty sure it’s a Canadian thing, so if you have no idea what I’m talking about, I don’t blame you. Basically, DND (as it shall now be known) is a frozen chocolate cake with star shaped chocolate frosting piped on top. I haven’t had DND in ages, but what I remember loving about it was the fact that there was always cake on had. It was frozen, but magically easy to slice and enjoy at all times of the day (whenever my mom wasn’t in the kitchen). 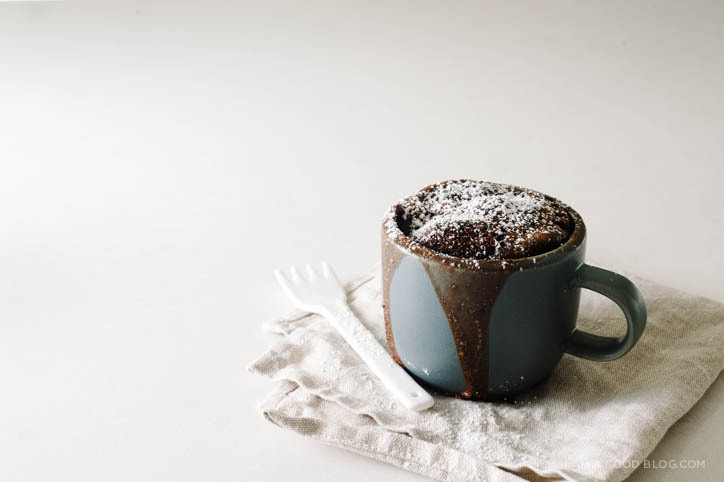 This mug cake is almost as easy as pulling a pre-made cake out of the freezer, but it has the bonus of being warm. 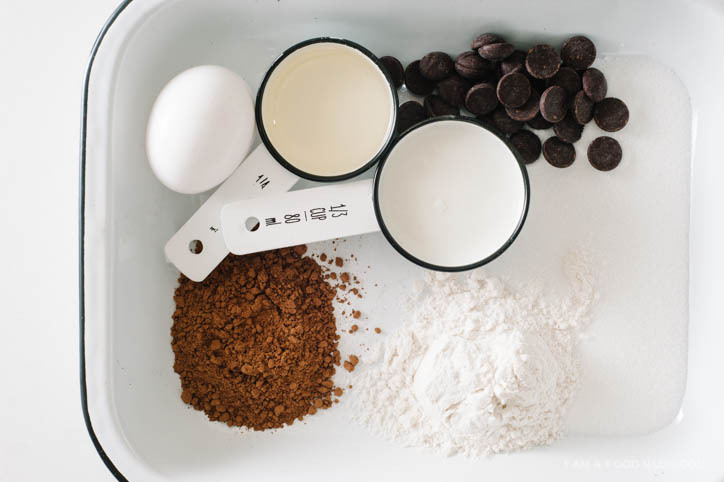 Like most mug cake recipes out there, this whipped up in a flash. I mixed all my ingredients in a glass measuring cup, poured and microwaved. I really, really wanted this to be my grown-up version of DND but it fell a little short. I’m not sure if I’m a fan of mug cakes, partially because they’re done in the microwave. I love the idea of single serving, but haven’t had a mug recipe that’s wowed me. Do you guys have any fast favourites? Stir together the egg, milk and oil in your mug. Add the dry ingredients and mix well. Stir in the chocolate chips and vanilla. Microwave for 2 minutes. The cake will rise above the mug, so place a plate underneath if it makes you nervous. Cool in the mug and then enjoy, either straight from the mug, or tipped out onto a plate. Sprinkle with icing sugar, if desired. Anything that can be made in two minutes and look this good is definitely dangerous!! YUM! I usually find that mug cakes come out spongy and tasteless. One time, I even experienced an inexplicable batter volcano that devastated the interior of my microwave. But your photos make me want some cake! I have never had a mug cake that turned out well but this mug cookie http://www.number-2-pencil.com/2012/03/06/chocolate-chip-cookie-in-cup/ is incredible. ooh, i’m going to have to try this! This chocolate chip cookie in a mug is INSANE. So good. 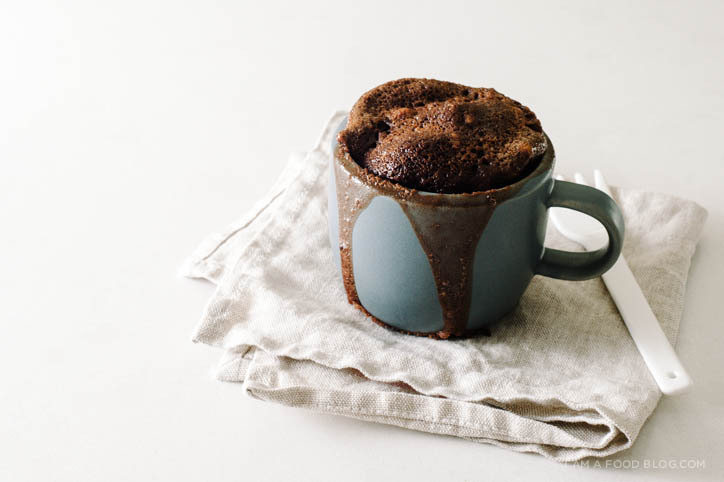 Now I think I need to try this mug cake. I remember loving DND a lot…then I had it as an adult…less delicious than I remember. yeah, i’m scared of trying DND again…just in case my memories are ruined. Love this so much!! Great photos, too! 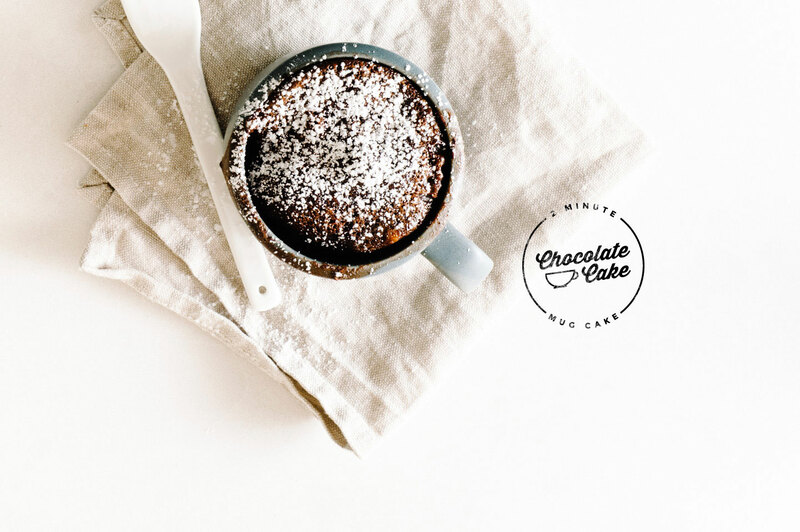 I’ve always wanted to try making a mug cake because they sound so easy when you have a sudden evening choccy craving. But you wouldn’t make this again? IF I do make it again, there are going to be some changes. I’m not sure what those changes are yet, as I’d have to fool around with it…that being said, if you eat it right when it comes out of the microwave, it will definitely hit your chocolate cake craving. But, i thought it was a touch too rubbery. Maybe lessen the microwaving time would help. I made these with Less time, due to my microwave being high wattage. as soon as I saw it rise, I stopped the microwave, it was perfect, I tipped Cream in & a strawberry on top…it was Delish!! I’m looking for a great microwave cake too, for emergency cravings. I’ve found that eggs in these recipes tend to make the cake rubbery (at least for me) so I usually opt for ones that leave eggs out. However, I’m curious to try your version since I’ve never included chocolate chips in mine (just cocoa). Hmm, I think you’re on to something with the eggs and rubberiness. Maybe a vegan mug cake would be the way to go! Ever heard of crazy cake or wacky cake? It’s a Depression era recipe for chocolate cake that does not use eggs. 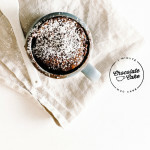 I found a mug-size recipe here: http://www.sweetlittlebluebird.com/2013/04/crazy-cake-in-mug-no-eggs-milk-or.html?m=1. It was pretty good, and tasted just like I bake it in the oven. The full recipe is the first one I ever learned to bake by myself, and is a family favorite! HOLY CRAP I absolutely second that Wacky Cake recipe. I just now made it and it is super good, rich and moist and not in the slightest rubbery. Definitely my favorite mug cake so far. This cake has the exact texture of a cake!!! Must try! Wacky cake is the go-to chocolate cake our family has always made. It is perfect for doubling if you need a larger cake. My youngest daughter used to come home fromschool and make it as a “snack.” I have this one comment to make and that it tastes better the next day, more chocolatey tasting than hot out of the oven. Also, I have accidentally left the baking soda out and it was very much like brownies. However, when I was pregnant I made one and it came out awful tasting so made it a second time and it came out awful again. The third time I realized I had put baking powder in it instead of baking soda. It was definitely not edible with baking powder. 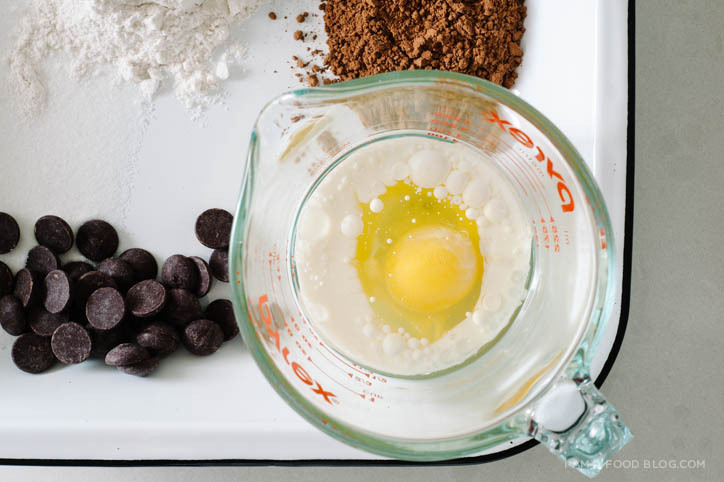 You also don’t have to use a mixer to make this. I just made this, found your AMAZING site through another food blog, and this was DELICIOUS!! and, your in my Favourite city in the world!!! Love your work! I love this idea! I bet it would work with an all-purpose gluten-free flour, as well. Thanks so much for this recipe. Thanks Shari! Let me know how it goes if you do try with gluten-free flour! WOW! I love thinking that when want some warm cake, I am only two minutes away. This looks incredible! Thanks! It’s both wonderful and horrible, isn’t it? Knowing cake is only 2 minutes away! Hey Steph, I think I can manage this one. Hehe. This looks so good and easy! thank you , i love it ! It’s the egg that makes them spongey! The key is an eggless recipe. I mean, you usually only use 1 or 2 eggs for an ENTIRE cake, so a whole egg jut for a little mug is a lot. I use this recipe: http://www.budgetbytes.com/2012/06/the-one-chocolate-mug-cake/ you also put a filling into this one, whether it be jam, peanut butter, Nutella…whatever tickles your fancy. It’s turns out almost as good as an actual cake! I tried this recipe last night and ran into some problems… Is 3 TBSP of oil (I used canola) a bit much? I looked at the back of a boxed brownie mix I had in the pantry. It required twice the amount of oil in this recipe. The boxed brownies serve 16. If I did my math correct, each serving of brownie would get ~1/2tsp of oil. Maybe the boxed brownies have something else in the pre mix that requires only a minimal amount of oil… Not sure on that. Just a comparison. Anyways, back to my problem last night. I replaced the egg with 4TBSP of applesauce and a pinch of baking powder. Other than that, I followed the recipe. I put the batter in the microwave for probably a total of 3 minutes. All it did was bubble/boil. Sometimes I let the batter sit to cool off. I did not want the chocolate, or anything else, to burn. Finally, I stuck the batter in the oven. Again, bubbling/boiling occurred. I gave up and took the ramekin out of the oven to let it cool off. When I came back there was a thin layer of liquid. I couldn’t figure out what it was and why it was there. I decided to taste the liquid. It was the oil. YUCK! I literally poured the excess oil out. After that, I used 2 paper towels to soak up as much oil as I could. I put the ramekin back into the oven for about 5 minutes. Nothing happened. I put a scoop of vanilla bean on the brownie and devoured it. The brownie was good. If it weren’t for the overpowering flavor of oil (the ice cream helped cover some of the flavor), the brownie would have been delicious. Anyone else have this problem? From the comments it looks like no one has :( I will definitely be making this again. Maybe I will sub the oil for ~1 TBSP of butter next time. I love this recepe! Thanks for sharing! Just made this using half and half (it’s all I had on hand) instead of milk and microwaving for 30 seconds less than instructed. It totally hit the spot. I’d recommend tipping the cake out onto a plate—the chocolate chips will all sink to the bottom, creating a layer of gooey goodness that pairs well with the cakey floof on top. Again, under- rather than over-microwaving is key! 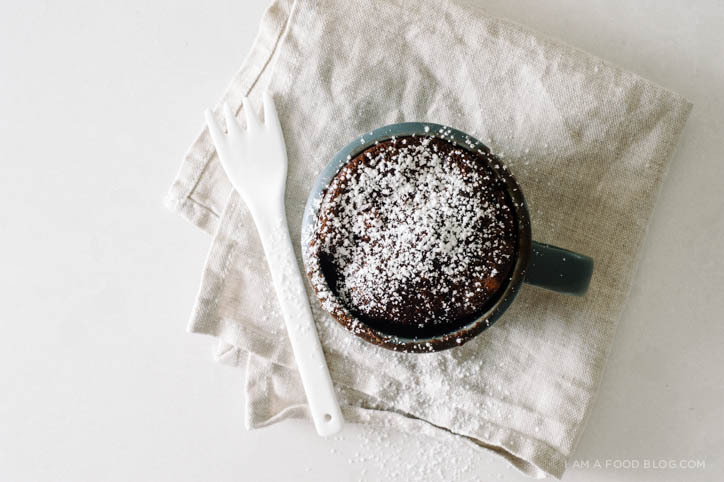 After eating a couple of tasteless spongy mug cakes…..I have finally found my go-to recipe for my chocolate cravings and that too one I can whip up under 5 minutes. Thank you so much!! I reccomend you to add some coconut flakes to the mix and also some baking powder,that makes everything taste so good.